A DEAD TREE SET AGAINST A SPECTACULAR DUSK SKY It's autumn, time of falling leaves, but this tree hasn't had any leaves fall from it for quite some time. I was driving along Stanley Road, the B5094 between Cheadle and Handforth looking for a dusk sky photo-opportunity and found this dead tree silhouetted against a spectacular sky. The image reminds me of the paintings of the early 19th century German romantic painter Caspar David Friedrich. OK, here's your question: The eastern link road to Manchester Airport passes 50 yards from this spot, but it comes to a dead end just beyond the trees. What is the name/number of this road and why does it come to a dead end? Clue: You see this number used a lot in American films and tv dramas. 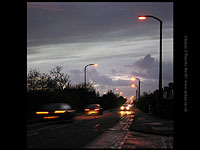 A ROAD SHORTLY BEFORE DUSK, street lights on, silhouetted against the sky, a row of terraced houses on the right, traffic moving in both directions - trees on the left... It could be anywhere in the Manchester area - or anywhere in the UK for that matter. This scene has a timeless quality about it - timeless because there are no clues as to when the photo was taken. We can't recognise the cars - they are blurred - the streetlamps date from the late 1950's or early sixties. There are no people in the shot. It's still the main access route from the east to a place familiar to millions, also the name of the road... What is the name of this road? EWM says: This road is familiar to me from my earliest childhood and looks the same today. WE ARE JUST UNDER THE FLIGHT PATH of the planes landing at Manchester Airport. This is the view from the front gate of a group of houses which overlook the landing lights of Runway One.We are on Ringway Road, next to the junction with another road, named after a place with a dark and mysterious ring to it. This name also refers to a forgotten 1957 air crash - one of only three major incidents to occur at or near Manchester Airport in the last 50 years. What is the name of the road? EWM says: I came here as a child with my mother and father to watch the planes landing, and still come today. A WATERY BLUE DUSK SKY, with scattered cirrus* clouds, just a tiny amount of redness left in the sky beyond the dark trees which form a U-shape enclosing this expanse of sky extending to the south, high over Cheshire. This is a timeless image, almost primeval. Lindow Moss and Alderley Edge are not far from here. But four years ago the hill on the right didn't exist. Can you explain? *Meteorologists, correct me if I'm wrong! 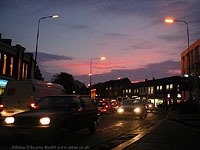 A TYPICAL LATE AFTERNOON SCENE at dusk in an English town in November. Orange sodium vapour lights standing out against a pink and blue sky, lots of rush hour traffic on the move, mostly people heading home after work. The lights of the shops and the offices are still on. That's an older VW Polo just passing on the left, and going the other way, a white Ford transit van - the type that always seem to get in the way when I'm taking a photograph. The white building on the right is Barclays Bank. But this scene is not as ordinary as it might first seem. On the left is a former theatre, familiar to many of the UK's most famous actors. Plays were previewed here before going to the West End of London. Now it's a furniture store. What is the name of the theatre? What is the name of the town? MANCHESTER AIRPORT makes its presence felt all over the south of Manchester. 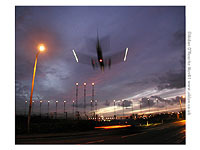 Planes on their final approach are visible from the city centre 12 miles to the north, and out in the countryside to the south. Depending on the wind, you can hear the whining of jet engines as the planes take off, and even pick up the scent of aviation fuel several miles away. I grew up with the airport, and still enjoy look at the planes as they land. Many of them are familiar to me. This one is the Airtours DC10. Airtours, based in Rossendale, Lancashire, with a main office at Manchester Airport, is one of the UK's most successful travel companies. But where exactly are we? Those flats belong to a Manchester overspill estate built in the 1960's. At the bottom of the picture is a Tesco hypermarket, part of a out of town shopping estate completed around 1994 This place also contains the name of a river. Where are we? EWM says: Let's head towards Manchester now, passing through the town where I spent my childhood. A NEO-CLASSICAL facade made of honey-coloured stone, with a doric portico in the centre and wings extending either side. It stands on an elevated site overlooking a busy main road. 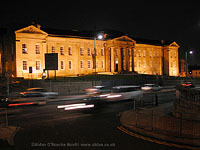 Here we see it at night, floodlit, the traffic is blurred. Quoting from a source which I'll reveal later: "The first stone of the noble structure was laid on the 18th June, 1832, & it was completed & opened in the following year." WE ARE ON THE A6 heading from Stockport to Manchester and we are nearly half way there, in a place which is the subject of the Eyewitness update following this one, Lovely Levenshulme. It's night, but there are still plenty of lights on. Looking closely at my high resolution original of this image, on the left we have the Claddagh Cafe - Claddagh is an Irish word meaning friendship. Next door, on the corner is Hennigan's Sports Bar. At ground floor level there is some new brickwork with the letter H, but at roof level, the corner sign says: Farm Side 1898. Set back from the main road, is the Palace Nightclub, currently closed, with all lights switched off. Next to the Palace there's a doorway and sign - this is a taxi company. On the corner on the right is the Topkapi takeaway, offering Turkish cuisine. Question: The Palace Nightclub is now probably Manchester's top Irish club, but what was the building used for previously - in fact, that should read: 'This half the building' as the other half was demolished. I don't know about you, but wandering around Manchester after dusk is making me thirsty - How about a quick pint of 'the dark stuff' in Hennigan's? THIS IS THE INSIDE OF HENNIGAN'S SPORTS BAR, and it's packed full of people. In fact, we've walked into St Patrick's Night 2001! It's packed full of people well wrapped up in dark coats against the cold outside. The globe-shaped bar lights give off a warm reddish glow, and behind the bar, there are two tv's, an array of beers and spirits. The proprietor is genuinely Irish. This could well be an old-established Dublin pub, unchanged since the time of James Joyce, the walls turned brown from decades of tobacco stains. But that's not the case here. Have you any idea what this place was before it became Hennigan's Sports Bar? WE ARE ON GREY STREET, West Gorton. The main Manchester to London railway line crosses over Grey Street at this point. Piccadilly Station is about a mile and a half (2.5km) from here. We can still see the original arched bridge, built when the line was constructed around 1840. Since then it has been widened. Longsight depot is off the picture to the left. Electrification came in 1960. Despite the changes, this scene captures much of the atmosphere the 'old' Manchester. On this side of the bridge we are in West Gorton. What is the name of the district through the archway?